On Friday, Alan and I visited the New Jersey RV and Camping Show at the New Jersey Convention and Expo Center in Edison. The sudden availability of RV shows in the Northeast at this time of year is one of the few things I love about winter life after Christmas. If it was snowy, but sunny and 60 degrees, I could certainly round up a little more enthusiasm for the months of January and February. However, since that’s not the case, I tend to entertain myself with travel planning and RV shows. 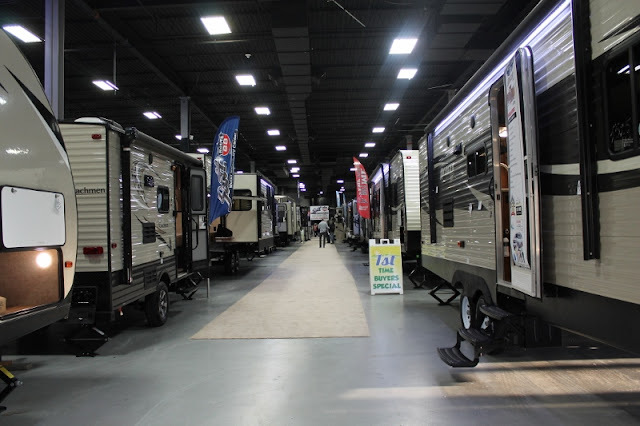 This was the first time we’ve attended this particular RV show and I have to admit that America’s Largest RV Show held in Hershey, Pennsylvania every fall is still my favorite. That being said, the New Jersey show did have a nice assortment of RVs with a fairly equal emphasis on fifth wheels, travel trailers and Class A’s. There were a number of Class C’s, too, but they were not as well represented as the other three types. There were only a few pop-up tent campers and expandable hybrids which I think would have made for a disappointing outing if you were looking to start out with a smaller unit or were interested in downsizing. There were only a couple of Class B’s and, I believe, just one lonely truck camper. The show featured seminars by Bernie J of radio show “Bernie’s Colorado Journeys” fame as well as numerous displays from campgrounds around the Northeast and other related camping services. 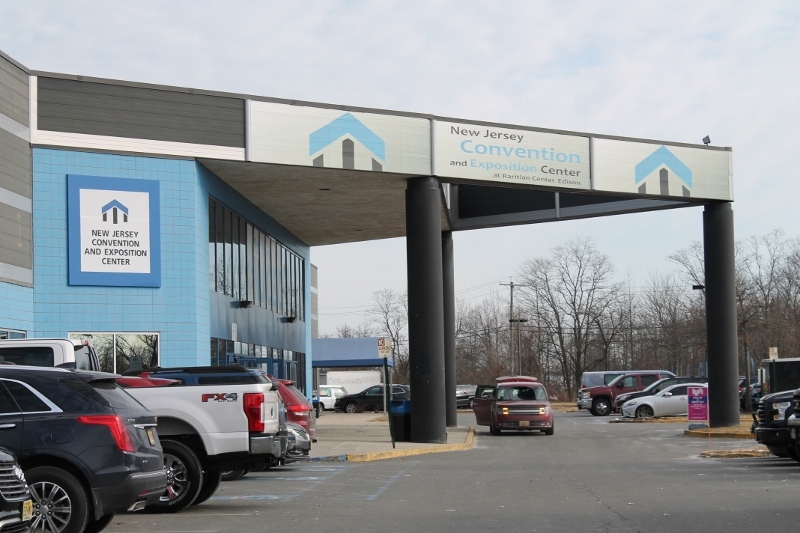 We spent an enjoyable four hours wandering around the New Jersey Convention and Expo Center. Attendance seemed fairly light, but we did go on a weekday - I’ll bet it was a different scene on the actual weekend! It was a bit quiet at the start of the show, but traffic did pick up later. Please note that Alan and I are not in the market for a new RV. In March of last year, we purchased a Creek Side travel trailer made by Outdoors RV Manufacturing, a small company in Oregon. We LOVE our Creek Side and are not the least bit interested in anything else. But RV shows are an excellent off season diversion for us and we’ve always enjoyed attending them for a number of reasons: They’re something out of the ordinary and make for a fun day out, we get to explore all of the really expensive coaches that are gorgeous but just don’t fit into our camping lifestyle, we’re able to see the latest and greatest innovations in the world of RV travel and . . . there’s always food involved! Yup, promise me a delightful breakfast out (or lunch or dinner) in addition to an RV show and I am IN! And guess what! On Friday, I got breakfast AND dinner! Yay! 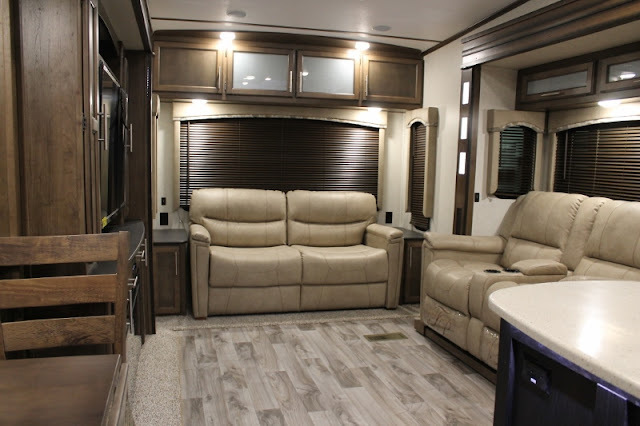 The trend in interior design in the RV industry these days seems to be very light walls with cabinetry in the shade of a medium brown with a little bit of grey in it. In fact, lighter colored cabinetry wasn’t uncommon either and, although flooring still tended toward a wood-look vinyl, in some cases the floors and walls were a lighter gray, as well. Light floors and walls were popular. It’s an interesting turn away from the rigs of a couple of years ago when we were seeing a lot of dark wood and dark interior colors. 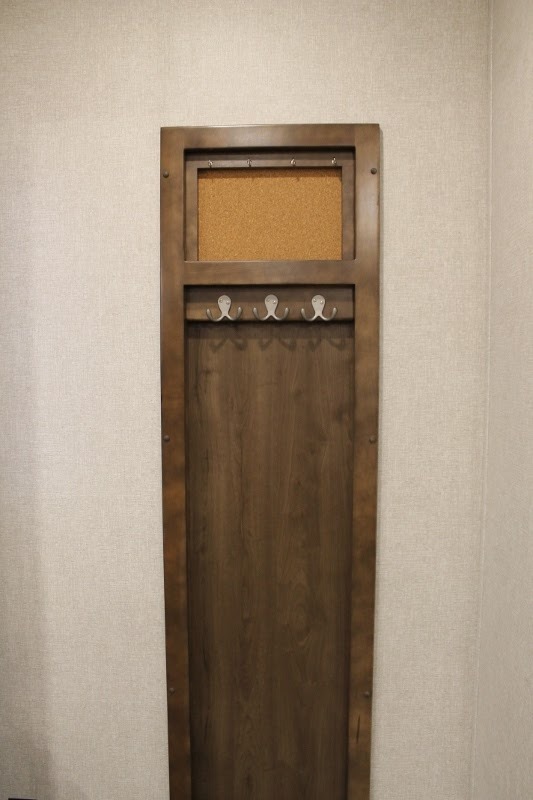 I’m sure that, as with regular home interior design, the styles and colors in the RV industry are constantly changing. 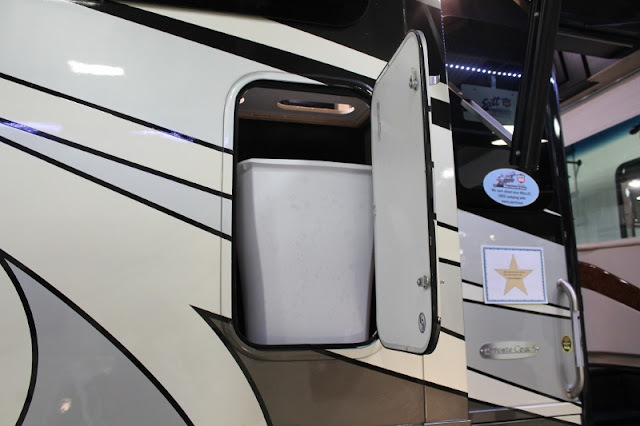 No matter what’s in, though, we definitely find it fun to tour the brand new RVs and check out the new designs, a few of which were quite intriguing. First, there was a unit with what appeared to be a drawer under the shower in the main bathroom. Hmmm. A drawer? Naturally, we had to open it up and guess what we found? No, we’re not sure what it is either, but we think it’s a food and water station for your pet. If anyone has any other ideas, please do share because we have no clue here! A food and water station for your pet? We also saw a clever way to collect your trash and easily dispose of it: One particular Class A had an outside compartment door that allowed access directly to your . . . trash can. What a great idea! 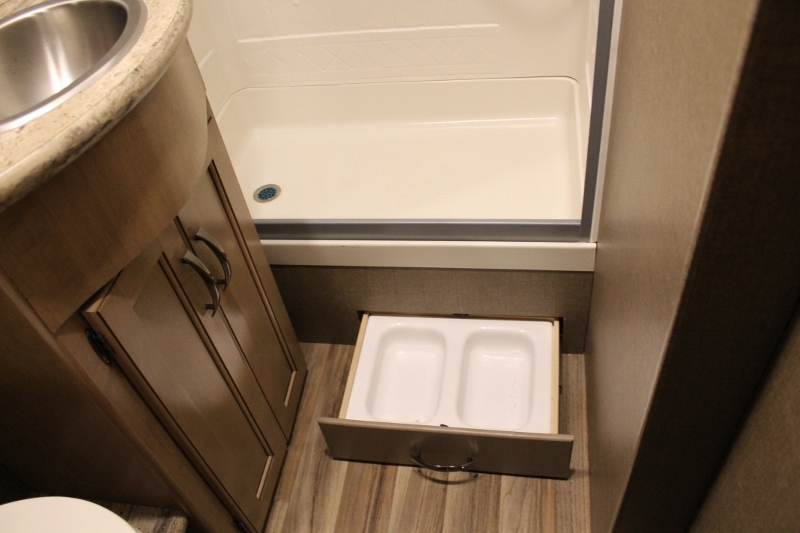 But the innovation that received our biggest round of applause was the addition of “den” or “family room” to the larger fifth wheels, ideally giving the grandkids a “play space” of their own with a loft overhead for sleeping. 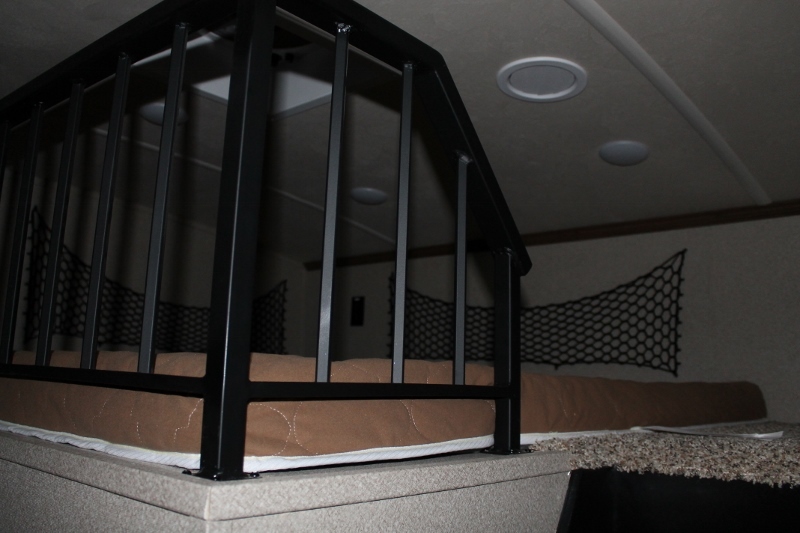 I’m not sure what the manufacturers are calling it, but the “family room” on the Cedar Creek fifth wheel we inspected was cozy and comfortable and the ladder stairs next to it led up to a sleeping loft that would easily accommodate several young grandchildren. (As you can see, a safety railing was in place.) Although Alan and I don’t have grandkids, we both could see that this would be a wonderful way to travel with those special little people in your life. So, there you have it. It was a delightful day out at the New Jersey RV and Camping Show! We got to see a significant number of new designs and innovations and we enjoyed both breakfast AND dinner out. Here’s a shout out to the Red Line Diner in Fishkill, New York – the diner is tastefully designed and comfortable, it has excellent food, reasonable prices and a staff that works hard to serve you well – plus, it’s a busy, busy place. That speaks volumes. If you have a favorite RV show, please feel free to share the details in the Comments section! I agree- I think the slide out under the shower is for pets! Looks like going to an RVer's candy store!